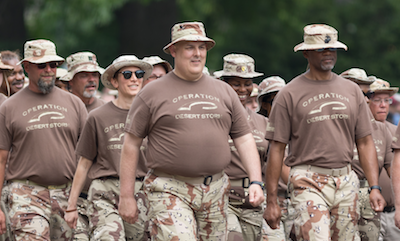 Veterans of the Gulf War march in the 2018 National Memorial Day Parade in Washington, DC. About 200,000 veterans of the 1991 Gulf War continue to suffer from Gulf War Illness (GWI), a set of symptoms including chronic pain, fatigue, and memory impairment caused by sarin chemical warfare agent, pesticides, and pyridostigmine bromide (PB) pills meant to protect soldiers from nerve gas during deployment. Decades later, these exposures may also be causing higher rates and earlier onset of chronic medical conditions in Gulf War veterans than their non-veteran peers, according to a new study coauthored by School of Public Health and School of Medicine researchers. The study, published in the International Journal of Environmental Research and Public Health, found Gulf War veterans reported high blood pressure, high cholesterol, heart attack, diabetes, stroke, arthritis, chronic bronchitis, and other chronic conditions at rates normally associated with people about a decade older than them. Veterans who reported being exposed to chemical warfare agents and taking PB pills had especially high rates of heart attack and diabetes. The researchers compared the prevalence in 2013 and 2014 of nine chronic medical conditions in two cohorts: 448 members of the Ft. Devens Cohort, the earliest and longest-running study of Gulf War veterans; and 2,949 non-Gulf War veteran participants of the National Health and Nutrition Examination Survey (NHANES) matching the age range and other demographics of the veterans. They found that male Gulf War veterans were more likely to report high blood pressure, high cholesterol, heart attack, arthritis, and chronic bronchitis than their non-veteran male peers. Female veterans were less likely to report high blood pressure than their non-veteran female peers, but 19.5 percent more likely to report diabetes. Veterans who reported war-related chemical weapons exposure were three times more likely to report diabetes than veterans who had not been exposed. Veterans who reported taking the prophylactic anti-nerve agent PB pills during deployment were 12 times more likely to report a heart attack than veterans who did not take the pills, and were also more likely to have diabetes. “This is the first study that we are aware of in Gulf War veterans to report these toxicant exposures to be related to increased prevalence of these chronic conditions,” says study lead author Clara Zundel, a doctoral student at the School of Medicine. The researchers also compared male Gulf War veterans in their 40s, 50s, and 60s with their non-veteran counterparts in the same age ranges (there were not enough female veterans in the sample to do the same for women). They found that male veterans in their 40s were 27 times more likely to report a heart attack, male veterans in their 50s had significantly higher rates of arthritis and chronic bronchitis, and male veterans in their 60s were five times more likely to report a stroke than male non-veterans in the same decades of life. The veterans in each age group reported many of these conditions at rates similar to or even higher than non-veterans a decade older than them. “Collectively, these results indicate that toxic wounds from GW deployment-related exposures appear to be associated with more than the chronic health symptoms of GWI, but also with chronic conditions of aging,” the authors wrote. The study was co-authored by Timothy Heeren, professor of biostatistics, and Patricia Janulewicz Lloyd, assistant professor of environmental health. The study was led by Maxine Krengel of the School of Medicine, and the other co-authors were Megan Yee and Claudia Grasso of the VA Boston Healthcare System and Steven Coughlin of the Medical College of Georgia at Augusta University.